26-Mar-2007 -- The planning of the trip to visit this confluence point was partly done in remembrance of a similar visit to Botswana 10 years ago. We have visited a couple of confluence points before and could not let the chance go by to visit another one. Therefore the route was chosen with confluence points in mind right from the start. Eventually only one of the four planned points were visited but it was still worth the while. The trip started in Pretoria, South Africa on 24 March 2007 and went through the Central Kalahari Game Reserve from the South towards Maun on the edge of the Okavango Delta. From there we visited the Moremi and Ghobe Game Reserves as well as the mighty, and very wet, Victoria Falls. Another few days were spent searching for the old Hunters Road, on the eastern border with Zimbabwe, as well as visiting the awesome Kubu island on the edge of Sowa pan. This is where we made an unsuccessful visit to confluence point 21S 26E in January 2004. A successful visit was made since by Julian Stewart and party in August of 2007, congratulations! My interest for visiting confluence points was sparked by my good friend, colleague and fellow confluence point hunter, Jimmy Stone who tragically passed away in March 2007. See confluence point 21S 25E and the points Jimmy visited in his lifetime. We miss you Jimmy! The route took us through Central Kalahari Game Reserve from the South to the North past a place called Molapo. 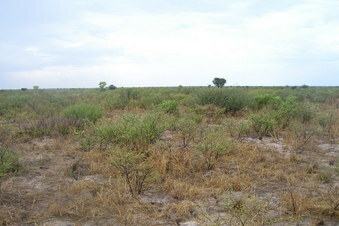 This is the less traveled route as most people only visit Piper and Deception Pan in the northern parts of the reserve. Just before Molapo, the road passes very close to confluence point 22S 24E. Apart from the road we were traveling, there were no other official roads within about 100 km radius, so we were quite surprised when it took us to within 1000 m of the confluence point. A whole day was required to travel just over 200 km from the southern entrance, to Khutse Game Reserve, through thick Kalahari sand to close to Molapo. Four-wheel drive is essential and tires were deflated to less than 1 bar to make speeds of up to 40 km/h possible. We ended up camping about 20 km from the confluence point as darkness prevented a successful visit that day. On 26 March we left our bush camp and drove the last 20 km to 22S 24E. As this is a Game Reserve, we did not want to drive off the official road and were very glad to get so close to the point by vehicle. The last few hundred meters were covered on foot by the men in the party while the women stayed behind at the vehicles. Although this is a Game Reserve, lion and other dangerous predators normally follow the antelope, of which we did not see much in this area. Therefore we did not consider walking in the bush very dangerous but we also did not spend more time there than necessary. After the point was visited successfully, we continued north and camped in the Deception Pan campsite. This was a wildlife experience of note, especially after viewing a photograph, at the entrance of the park, of a black maned Kalahari lion male exiting one of the ablution facilities inside the park. This park, and Botswana as a whole, is a must for the wildlife and nature enthusiast. In the Central Kalahari Game Reserve.